I can't believe it's been 2 weeks since my last post, but what a 2 weeks it's been! Firstly I've been unable to get to the computer because we've had 3 teenage guests to stay, namely my stepdaughter and 2 of her friends, all of them 14 and a bit. They sleep in the room where we have the computer, and boy do they sleep!! I think the record was 5.30 pm one day, most other days they crawled out into the light, blinking like moles and yawning profusely, at about 3-4pm! So I must apologise for my lack of contact, I have been cut off from my new hobby for 2 whole weeks and I've been suffering from severe withdrawal symptoms! The second major upheaval in this house has been the weather. Thursday night last week brought the most tremendous thunderstorm and rain like I have never seen in my life! Throughout Friday it never stopped and after a nine hour journey back from work (it normally takes 50 mins) Ian arrived at 2am to be informed by our nocturnal teenies that water was appearing from under the walls in the basement rooms they sleep in. After 2 hours of unsuccesfully trying to bale out we gave in and went to bed, and woke up to 2 inches of water in every room down there. So we are officially flooded for the first time in our lives, but we are much luckier than so many more nearby (although we are the only ones in this street - how did that happen?). Watching the news some people have lost almost everything and won't be able to go home for months. We use our basement rooms for guests and Ian's "playroom" (ie. bike store!) 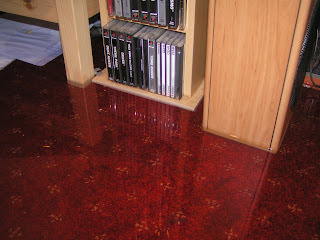 so we can manage without them, and another positive is that I can finally get rid of the horrible carpet! To add insult to injury we have been told that our water will probably be turned off at some point tonight for maybe 3 days. I suppose we could at least go down stairs and ladle a bit up if we're desperate! I must also say a big thank you to friends who offered help when we needed it, times like these show you who your true friends are! This is my nest, just for you, sophie. How I look forward to falling into it at the end of the day. 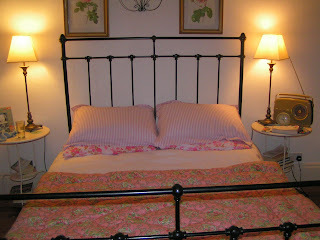 Notice the stripy pillowcases, bought after a very kind tip from Sophie's blog. .....................and I would walk 500 more! Were we lucky or what?? 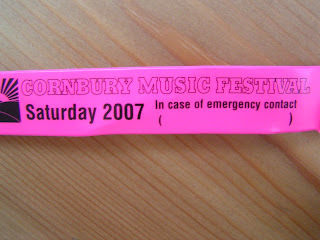 We went to the Cornbury festival on Saturday and managed to get a whole day of glorious sunshine amongst weeks of rain and clouds! The sky was blue, the music was great, the food was fabulous and even the toilets were clean(ish)! The Proclaimers, The Waterboys and David Gray were among the bands on offer and all of them were brilliant. After an initial hiccup in behaviour (from both mother and son, over a trampoline!) our children were angels and it was great to see them all dancing to music we love. I would highly recommend it to everyone as a great festival to visit with (or without) kids. 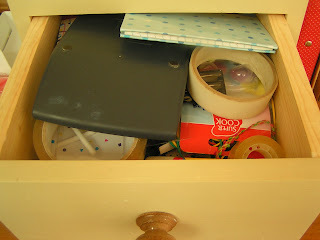 Now feast your eyes on this little lot - does everyone else have drawers like this, in every room, drawers that you daren't open unless you're looking hopefully (and in vain) for that last AA battery or a plaster? I'm sure if I count up on my death bed I'll have wasted about 4 1/2 years of my life looking through drawers, under sofas, behind beds etc.! 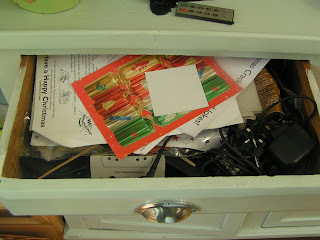 How I envy those organised people who open their drawers and have only one or two items laid out neatly and in a logical order, who possess sock dividers and who never ever forget a birthday, anniversary or to MOT the car! Chaos rules in this house, every morning I can be heard screeching down the street to "Get your shoes on , where are your shoes, where did you last see them, oh b....... we're late!!!" ....................too late!! They have to earn their keep you know! It's going to be an exciting weekend, can't tell you why but there's a clue in the title.......I'll update you in my next post. 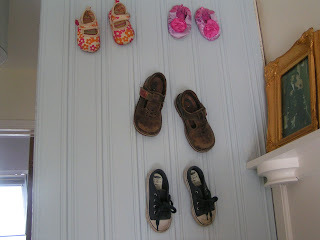 Because I find it difficult to part with anything I couldn't bear to get rid of the childrens' baby shoes, so I nailed them to the cupboard on the landing - the shoes NOT the children! They remind me of those little baby feet! 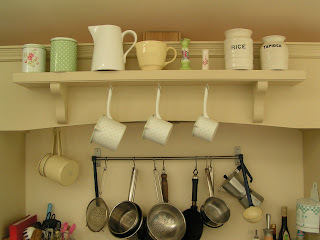 Just a few of the things hanging around the kitchen. 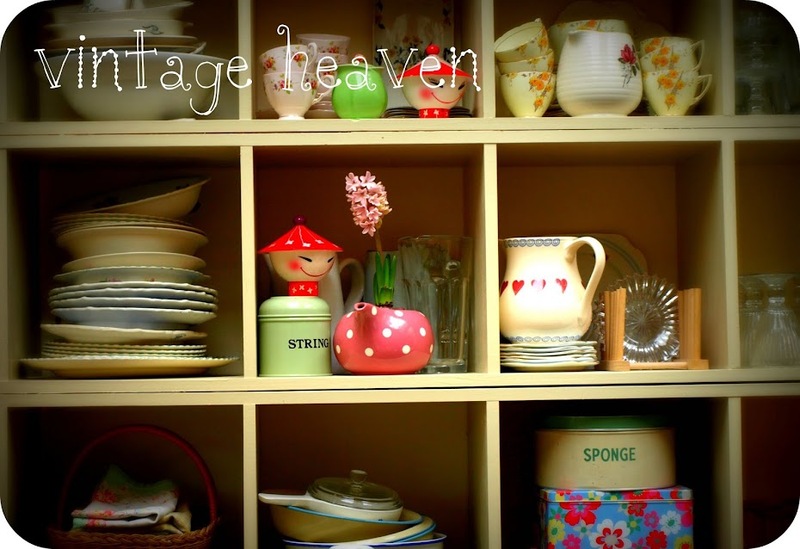 I like to be surrounded by "stuff" and once the kitchen was finished I couldn't wait to fill it. 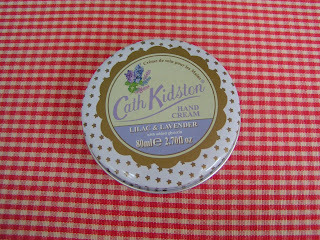 But I did make a pact with myself that it should be stuff that I use on a regular basis, and I'm trying to keep to that! I even use the little enamel pan to make a tiny portion of gravy for my chips from the chippy - I am Northern you know, and they don't do gravy down here! Finally the nicest part of our bathroom, the reason we bought the house! 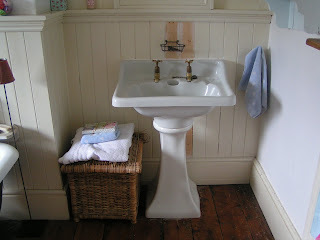 Don't look at the unpainted panelling behind the basin, just another job which will never be done! We weren't looking to move, having just finished the last house, but I love looking on property websites and saw a picture of this bathroom. It's a huge room because it used to be a bedroom so it can accommodate a roll top bath and an enormous airing cupboard as well as this lovely old basin. The taps are ancient and drippy, there's huge cracks in the basin and loo and actually the bath is too big to lie in comfortably unless you're 7' tall, but I still love the room. In fact when we exchanged contracts the first thing I did was rush out and buy a triple sorter laundry basket - Yippeee.......................I know how to celebrate!!!! 37 today, one step closer to the big four-o and the huge party I'll be having! I've had a fantastic day, the sun shone for a bit of it (expectations have been lowered when it comes to summer weather!) and Ian and I had a day without children, which is rarer than a total eclipse. My great friend Andrea had Kitty for the day and we skipped off to Nailsworth for a day of relaxation. Now, I know to some people this would be an insult as a birthday present, but I LOVE it, and I love that Ian understands my madness and bought it for me. 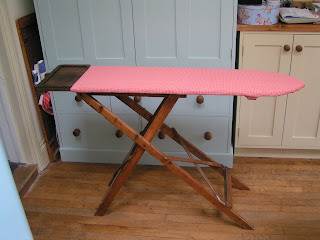 I'm not some closet ironing fanatic but it's old and worn and goes so well in the kitchen I figure I'll just want to iron - will it work, do you think?? We had a great lunch without being distracted, and had the luxury of sitting and drinking coffee without having to gulp it down before child one attempts to kill child two. All in all a fab day, worth being 37 for! I've had some gorgeous gifts, maybe I'll post some piccies at a later date, but I must say thanks to all my friends who read this blog (you know who you are!) for their thoughtful presents, very gratefully received! Kitty enjoyed her day, thank you for all the kind wishes. I'm now wondering how we can fit all these extra toys in the house! 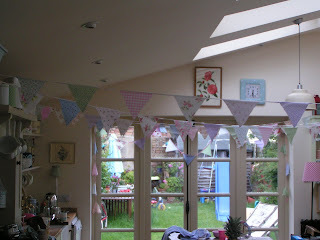 We decorated the kitchen with bunting because a garden party was out of the question, seeing as we're in the middle of monsoon season. 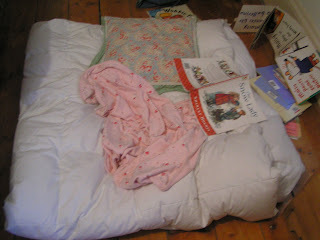 She partied with 4 of her friends, ate far too much junk food, screamed around the house and flaked out at about 6pm in her "bestest present" - the Barbie sleeping bag -Thank-you Andrea! 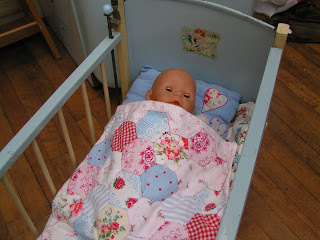 I have to say the rag doll and patchwork quilt I sat up until the wee hours slaving over did not receive as ecstatic a response! Barbie rules methinks! 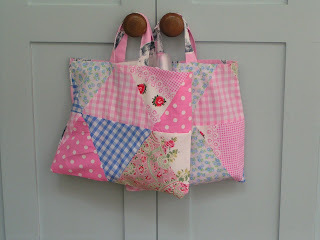 The patchwork party bags were well received - little did they know that halfway through making them I questioned my own sanity and wondered why I didn't just buy plastic ones! Lastly I must apologise for being a bad blogger - I will be catching up on all your news later this week - promise! 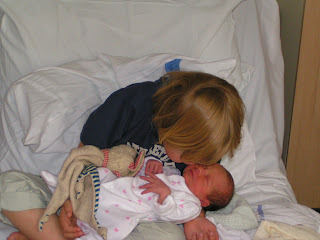 Three years ago today at 4.30 in the morning, five weeks earlier than expected, our gorgeous little girl was born. Weighing in at 6lb 3 oz she amazed doctors by needing no special care other than being wrapped up in about twenty blankets to keep her warm. 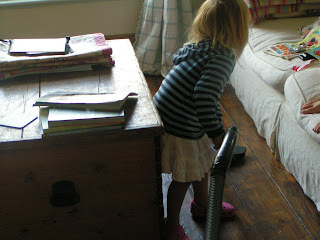 From that moment on she has delighted us every day, and driven us mad at times!! She's a great little sister to her big brother and she brings so much joy into our lives. Her constant smile, energy, and sense of fun make her a delight to be around and it's a great privilege to be her mummy. Happy birthday Kitty, we love you more and more as each day passes. 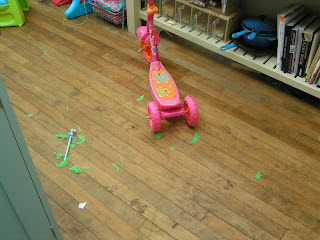 ps............back to normal tomorrow, hopefully I'll get up to date with blogging!